Wooden floors magnified the sound. It seemed like the very walls were pulsing with every beat. It was 2014. Greg had been dead for some months, and none of that actually happened. And then four years later, on Dec 27th 2018, it did. Well, almost. It just wasn’t Greg entering the crowded hall, it was me. The audience was already singing and stomping and clapping as I walked on stage (led by Freddy Mercury), feeling, for the first and only moment in my life, like some kind of undeserving, imposter rock star. As I took the microphone, the music stopped, the crowd calmed down and I burst out laughing. It was a strange upside-down start to giving a speech, but it certainly took the nerves away! Giving a speech to a clapping, stomping audience of hundreds of people was one of the last things I did in 2018. It simultaneously scared the hebejeebees out of me and changed me for good. 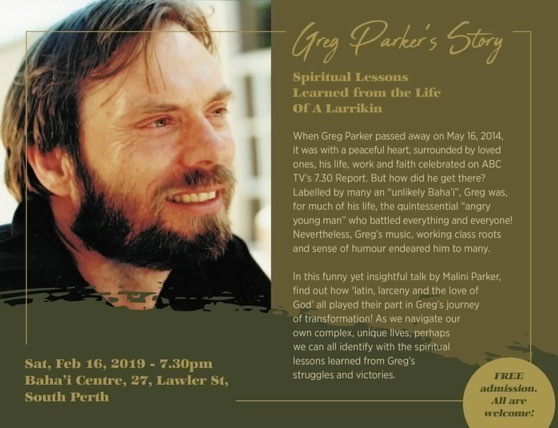 The title of my talk was From Larrikin to Leader: Lessons Learned from the Life of Greg Parker. I was invited to give this talk at the annual Baha’i Summer Camp, the theme of which was A Life of Generous Giving. Greg’s life was featured as a much-loved member of the community, missed for his music, his intellect, his loving-kindness, his sense of humour, his antics. “A life of generous giving” sort of summed his up. As I traced Greg’s life from childhood to his untimely death at the age of 59, I I think I surprised a few people with anecdotes from his less than salubrious youth. I certainly surprised myself when the audience laughed and cried in all the right places! Later on someone told me that they’d had a dream that Greg was right there in the audience, laughing along with us, very pleased that this was happening. Giving that talk altered something inside me. I’m still coming to terms with exactly what and how, but I’m not the same person I was before I wrote it. For a start, in preparing the talk, I gave myself time to really reflect on everything I knew of Greg and on how simultaneously hard and wonderful it was. Three decades together. I stepped back and I asked myself what I learned from all of it. At first, inviting the memories back in opened a floodgate of emotions. I had to read the stories he had written. I could hear his voice again. I could see him laugh (mostly at his own jokes). I could feel his cancer-pain. I wept. Write a talk about Greg’s life? Who was I trying to kid? I took myself back to the Southern Ocean, to Albany, to the beautiful place that never-was-our-forever-home, and I wrote. And then I drove back to Perth, walked up to that microphone, and spoke. And so, in the last days of 2018, I was gifted with so much love and a bunch of stomping and clapping, just like in my dream. Too attached? No one would have accused us of that when he was alive! The thing is, when Greg died, it was as if I lost ALL the Gregs that existed. The young, vital, passionate, exciting, strong, angry, unstoppable man I married … as well as the wise, patient, kind, gentle, luminous, loving man he was becoming. Grief was magnified by losing not one person, but losing all the versions of him that I’d ever known. And all the buried memories that had stayed locked away to keep me focussed on his care surfaced at the very same time. Right after he died. So, did I become more attached to him? Maybe. Or perhaps the shock of what surfaced was so overwhelming and unsettling that I did what I could to stop myself from drowning. Perhaps one of the things giving that talk has shown me is that I’ve finally learned to swim! In 2019, I’ll be entering my sixth year of LWG (Life Without Greg). There are times it still feels like he died yesterday and the pain is fresh and the tears flow. At other times, all I can feel is gratitude for the good, the bad, the difficult … the impossibly exquisite life we shared for 28 years. 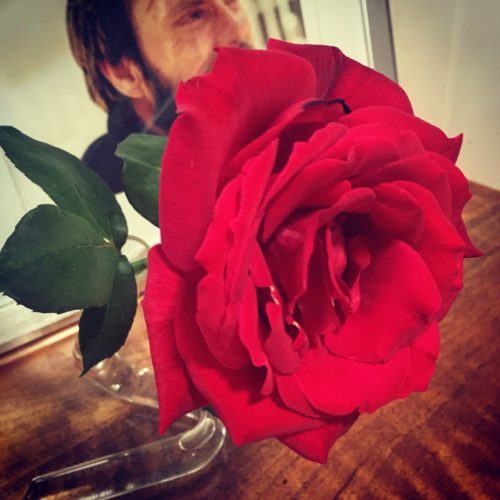 My naturally sceptical, once science-driven mind has accepted that he’s physically dead and yet still ever present, in many ways even more present than he was when he was alive… now my cheerleader, my protector, my helpmate, my finder-of-homes. Still a father to his amazing girls. Still a trekkie, but now he actually gets to visit the stars. It seems weird to say but LWG is a beautiful life. Even when my focus slips back to what I’ve lost, even when grief pops right back into the front seat … even on all of those days, LWG is still a beautiful life. Because there’s always the gentle eyes of my dog. The smell of coffee. Roses. Gorgeous friends. The play of light through the leaves. Breakthroughs by brave students. Being moved to tears by a song. Babies being born. All the surprising ways that prayers are answered. All the infinite ways to serve. The response that I received to that talk was a little astounding, including several invitations to deliver the talk again. I decided to this say ‘yes’ to all of them in ONE go, and offer this in memory of my lovely Gregory soon, before I chicken out! So, on Saturday Feb 16 I’m doing this again. And you’re all invited! Greg was a brilliant creative, and I share how his creativity helped him navigate the worst of times. In a sense, Greg was “everyman”, yet he was a mass of contradictions. He had deep faith, but was initially an arrogant opponent of it! Would this be your cup of tea? I don’t know. My talk is light-hearted but has an undertone of universal truths that I hope everyone can relate to – a collection of stories and spiritual lessons that I’ve distilled from observation of his transformation from the larrikin he was, to the luminary he became. I offer it in the hope that these stories might be of service to others. If that calls to your heart, I’d love to see you there. Admission is free, so you can just rock up. Details below. 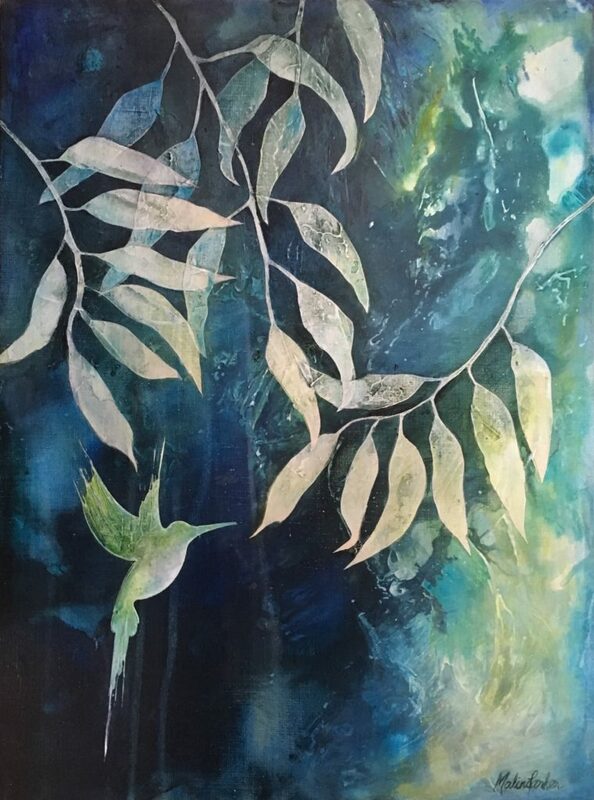 I’m only running this popular workshop on three dates: Feb 24, Mar 17 and April 14, before the rainy season starts, when drying layers of paint and texture in one day becomes problematic! So if you’ve been wanting to do this for some time, (and about 1500 people have done it before you!) don’t delay. You won’t get another chance until September! This workshop is for grown-ups only, so take the day off from your kids (and bring your partner) for a unique experience. CLICK HERE for the full details, watch the video or to enrol now. 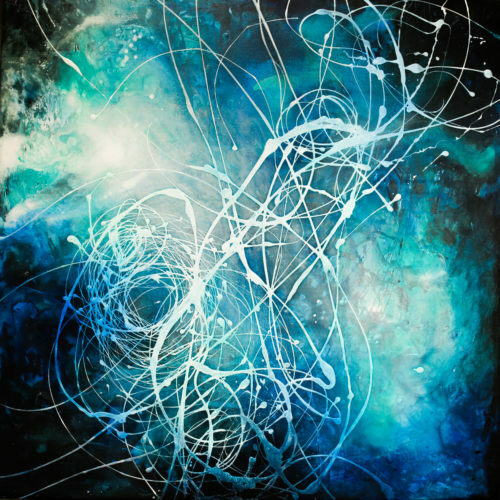 START WITH ART: Make this year better than before. 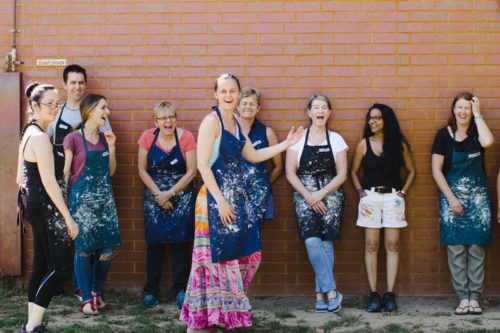 “The weekend was pure joy & so much more than simply an art workshop but rather a personal life development mini retreat for me… I went home feeling energised, enthusiastic, courageous & ready to step forward boldly into 2019.” – A.F. In this workshop I guide you through a unique combination of writing, reflecting and painting, to help you get clear on the shape and flavour of that all important upcoming period: The Rest of Your Life! Change ONLY happens when we start thinking and feeling differently. 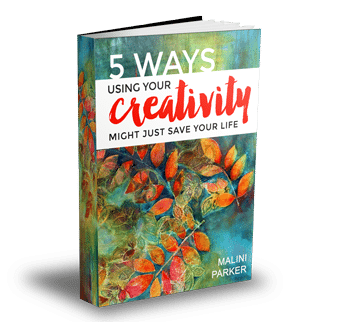 If we want our lives to flow with greater ease, why not start by combining our heart’s desires with the magical powers of creativity? 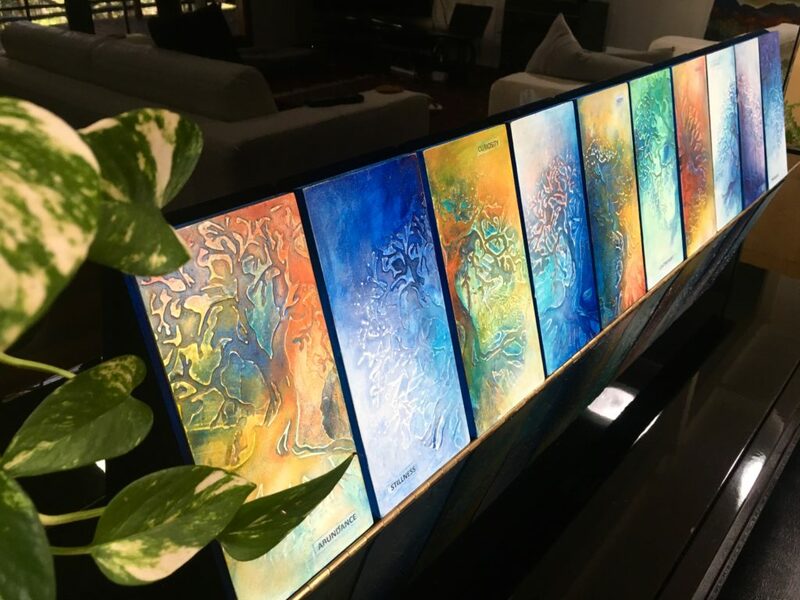 Over two beautiful days by the Swan River in Perth, we move forward gently, but with clarity and purpose, creating a beautiful tapestry of words and paint and texture, from which to build the rest of your life. 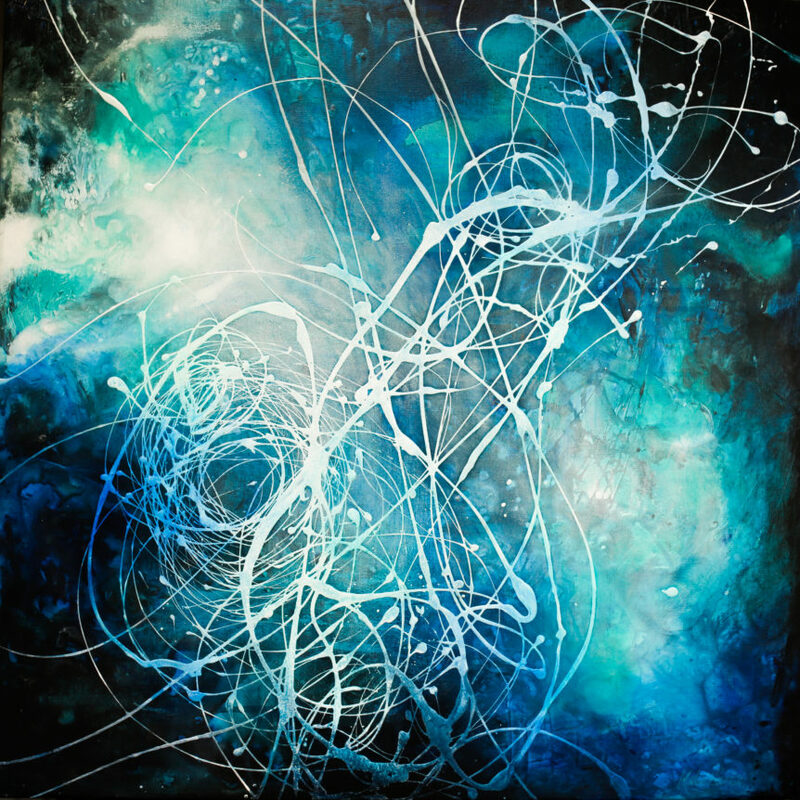 Starting with Art. “I came ALIVE and felt a sense of Peace … an almost ‘Coming Home” feeling… thank you for who you are and how you make people feel. You are blessed with a rare gift…A Magical two days.” -N. S.
Malini my sister– how do you do it? Just when I think you’ve said all that can be said about Greg, you bring out something impossibly beautiful and moving and take us all one step closer to understanding you and the man you married, and in doing so help us understand the world a wee bit better. I was at the talk first time, and wouldn’t miss your repeat for the world! Gosh, thank you so much for those words. They were rather poetic and touching. This was a hard post to write… too many emotions! I’m so happy you enjoyed it. And thank you for taking the time to read my work. ONYA!! Oops, I repeat myself. Thank you. Like Shanthi, i can’t find the words to express the depths of wonder & gratitude for this blog & others you’ve given us. Yvonne, that’s so very kind of you. Thank you, dear friend. I love that idea. We are indeed walking each other home. So glad that you’ve found making art to be helpful in your life. A kindred spirit! Even though I was not able to attend to the talk (because like you wrote, a baby was being born), I felt I was really there at the *stomp stomp clap* moment. So looking forward for the redo of the talk and so happy that you didn’t chicken out of it!! Loved the post!!! Onya!!!! Thank you for borning your beautiful baby! And for EVERYTHING else you and your amazing wife bring to this world! Malini, I knew Greg long before you met him and yet I learnt so much about him and about life. You shared his stories in an entertaining, educational, and inspiring way. I’ll be there and have invited lots of friends. Looking forward to hearing your talk again. Dearest Malini, I hope one of your talks about Greg can be posted on You-tube, for us out of towners to view! working on it Bryn, stay tuned! Malini–I’ve been following you for many of the years since Greg died. I’m so happy to see you return to life and joy. After our teen son died 10 years ago, I learned what a gift it is when his name is spoken by others and his life is remembered. Wow! You have been given an entire trove of treasure as so many celebrate Greg’s life with you! May this time of reforming how you carry him with you in the world be sweet…. Beautiful words, Malini. Thank you for being such an inspiration.